WOW! 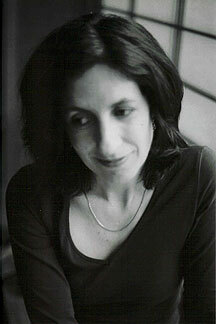 was honored to have guest judge literary agent Marie Lamba choose the fall season’s top winners. Thank you, Marie, for sharing your time and efforts to make these contestants’ dreams come true! Marie Lamba is author of the young adult novels What I Meant . . . (Random House), Over My Head and Drawn. Her work appears in the short story anthology Liar Liar (Mendacity Press), the anthology Call Me Okaasan: Adventures in Multicultural Mothering (Wyatt-MacKenzie Publishing), and her articles are in more than 100 publications including national magazines such as Writer’s Digest, Garden Design and RWR. 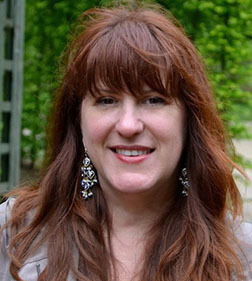 She has worked as an editor, an award-winning public relations writer, and a book publicist, has taught classes on novel writing and on author promotion, and belongs to the Romance Writers of America, and The Liars Club. As an agent, Marie is currently looking for young adult and middle grade fiction, along with general and women’s fiction and some memoir. Books that are moving and/or hilarious are especially welcome. She is NOT interested in picture books, science fiction or high fantasy (though she is open to paranormal elements), category romance (though romantic elements are welcomed), non-fiction, or in books that feature graphic violence. Some recently favorite titles on her reading shelf include Searching for Caleb by Anne Tyler, Just Listen by Sarah Dessen, Paper Towns by John Green, The Time Traveler's Wife by Audrey Niffeneger, Twenties Girl by Sophia Kinsella, The Graveyard Book by Neil Gaiman, Shug by Jenny Han, and Doing It by Melvin Burgess. She also admits to watching many many chick flicks. Please email a query to marie.jdlit@gmail.com. Put “Query” in the subject line of your email, and please send the first twenty pages in the body of your email, along with a one-paragraph bio and a one-paragraph synopsis. Thanks so much for the privilege of judging this contest. What a strong batch of contenders! I found myself drawn in again and again by imaginative story lines and tight writing. The top 10 distinguished themselves with high-interest content, strong voice, and sharp language. And my top 3 choices also showed me something I recognized in the world, but in a way that I’d never seen it before. I love when a writer does that! As a citizen of both Canada and Australia, Keith considers himself a global denizen, and hopes one day to make a memorable contribution to American history. His work teaching literature has built upon his inborn love of writing to the point that his most rewarding moments involve the laughter, tears and outrage of readers moved by his work. Inspired by his study of literature at Oxford, and by great authors like John Updike, he challenges himself to synthesize literary style and theme with the accessible, adventure-driven plotlines that entertained him as a young reader. Other publications appear in Stringybark Stories, literary anthologies published by I.E.U. Australia, and even in a literary magazine he edited himself during icy winters in Calgary, Alberta. 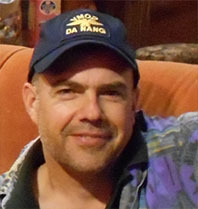 He is also the author of the award-winning (but unpublished) Starlite Lanes: We Bowl for Democracy, and another unpublished partner-novel—but not for long! Click here to read a sample. For the fourteen years that he had been collecting their trash, Stan had been amazed by the things that people would throw away. Their invisible wealth was revealed to him in the pieces that protruded from plastic bags—bags that he and Tamo would lift into their truck, crush with their compactor and carry away, condensed, to be returned to the earth. People discarded food and the dishes from which they had eaten it. People discarded computers and the satchels in which they had been toted. People discarded clothing and jewelry, carvings and ceramics and, today, one of them had thrown away an easy chair for him to collect. Like a throne amongst peasants, the chair perched between bundles of other garbage; to Stan’s eye, it was in perfect condition, and he felt his disgust with these dilettantes grow. Stan wondered how long he would have to remain with the Sanitation Department before he would consider buying a chair like this. He knew the rule about scavenging, and had never broken it. This recliner, though, was special: more than he could bear to see discarded. A word to his partner, Tamo, earned him an indifferent shrug of approval, and he bundled the chair into the cab of their truck to accompany him to his home. Stan loved his new chair. After a day shifting the refuse of those upon whom life had smiled, the chair enveloped him with a caress that seemed to reach into his world from theirs. It made him feel rewarded, and Stan knew from reclining in it that he deserved more nice things. Collaborating with Tamo’s apathy, Stan began to put aside more trinkets for himself. At first, he watched only for larger items, and was surprised by how a bit of scrutiny could unveil chesterfields, side-tables and settees from the filth. He became skilled with a sander and varnish, and through the strength of the neighbourhood’s wastefulness, soon had his home furnished in a style he had never imagined. This accomplished, Stan turned his attention to smaller decorations. They demanded more vigilance, requiring him to spend hours of his shift unwrapping prominent lumps and shapes from within the deep green plastic that sheathed them. Still, Tamo remained indifferent, resting his eyes in the truck while Stan searched for treasures that he found, inevitably, in twos or threes every day. Within the month, he had not only furnished his home elegantly, but also adorned it with brass figurines and exotic wooden carvings. Stan began to anticipate his time at home eagerly, his easy chair making him feel superiour to the widows and playboys who had so recklessly discarded these riches. It was on just such a day that the antique dealer came to visit. Stan was reluctant to leave his beautiful chair to answer the bell, but knew with a look at the man on the doorstep that phoning his shop had been the right choice. The dealer fussed over his things, peering at them through a pair of square-framed glasses that he perched on just the tip of his nose. By the time he left, he had taken eight small items and one furnishing, leaving Stan holding a cheque that dwarfed six months’ salary from Sanitation. Stan decided to sell more of his things, to finance holidays from the Department. Selling such finery in the antique store earned him some notice, and Stan nervously accepted when the dealer asked him to meet with a group of curious gentlemen at their exclusive club. Of course, he mentioned neither his career nor the source of his finds, and after a few more visits, one of his new friends offered Stan many times his salary to work in a glass building. Sitting in his chair that evening, Stan knew that he had finally become the man that his youth had once promised him. He worked very little, spending most of his days at the club, but collected more money each week than he had ever seen. Gradually, he began to replace his possessions with newer, cleaner items that he purchased from salespeople who called him, “Sir.” When one of them sold him a leather recliner, one day, he knew it was time to farewell his first acquisition: his old easy chair. He felt a pang as he wrapped it in plastic, but he knew that he could rely upon Tamo. Tamo would lift the chair into his truck and carry it, condensed, to return it to the earth. In the land of lenticular clouds and luminous moss, where the rain falls like ashes, sat an old Red Cedar. The tree had barely survived the clearing that had made way for the dairy farm in 1892. The farmer was too done in to take it down. For the next hundred years the tree reached up in ribbons and fans. Her skirt draped the grassy carpet beneath it, allowing rusty branches to reach back into the soil and give birth to more fragrant life. As the world changed from cart to car, the cows disappeared from the clearing. The farmer’s grandson traded tractor for briefcase. With the help of the crow and sparrow, the land began to take back what was once its own. The tiny farmhouse lost its legs and crumpled into the ground like a tired beast. Eventually, the backside of the Cedar’s petticoat touched the damp sunless part of the woods it was once part of, creating a secret unzipped place where the inside of the tree could be accessed. Charlotte thought the tree was magic because when she’d hid from her father on that first night it was with the tree’s full blessing. She’d wrapped herself in her hooded parka and snuggled in the warmth of the softened ground next to the trunk where years of falling sprays and leaves created a welcoming nest. She’d heard his shouts that night, calling out with anger and then later in feigned concern. The bruise on her face pulsated and she thought she’d heard the tree warn her to be still. She began to visit often: sometimes as the household rage boiled over, other times because she longed for the scent that was left upon her clothes or to catch the golden glimmer of its sap when the tiniest bit of sunlight made it down through the canopy. She would sit in the rain and read her favorite book without even a drop of water touching the pages. But she was not of the tree, and when she finally crawled out of the darkness to drink the water that beaded on to the flat sprays of leaves, Charlotte was still alone in the woods, without roots or the ability to soar high enough to touch the clouds—as insignificant as she’d been on that first perfect night, when she thought she’d found home. It was this nothingness that she took with her, back to the house of loneliness and fury. 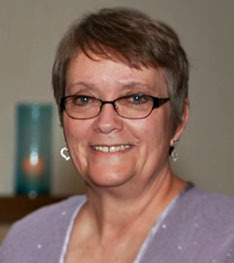 Kate F. Eaton has lived in Kansas most of her life, with brief interludes in Missouri. She writes copy for a number of online businesses as well as pursuing publication in fiction writing. Her love of a good story told concisely led her to flash fiction. As she submits her flash stories to contests and literary journals, she is also making final edits on a novel written during NaNoWriMo 2014. During moments of downtime, Kate and her wonderfully supportive husband are restoring a vintage “canned ham” camper and enjoying life with five adult children and their growing families. You can find Kate online at http://katefeatonwriter.com. “Run.” You laugh the warning back to me, racing ahead through the midnight field, plowed that day by our neighbor. By the vast harvest moon, I see the dirty soles of your feet, watch you leap across the furrows and into the sheltering corn. You’re already on your belly in the row, your shirtless torso filthy with sweat and loam. I dive down, lying still beside you, listening for sounds of clumsy-footed work boots close behind. And then we’re up again, light-footed, sneaking foxes, flying down the rows of drying, whispering stalks that stand two feet above our heads. We’re running side by side, a row apart, scanning the corn for an ambush. You freeze, I freeze and then we listen. We could be playing Red Light, Green Light, except that no one’s calling the game. No need. I know by the sound of your clever feet when you begin to run, full out. And so we do, run so swiftly that our field work strengthened legs pinwheel behind us. We break free from the cornfield and make for the sheltering row of cedars. A shot rips through the darkness, we hear the rock salt smack into the trees above us. “Missed again.” You whisper it, still laughing. You are afraid of nothing. We hear the curse, the creaking slam of an ancient pickup’s door. The engine rattles, coughs, the gears engage. Crawling to the entrance of our hideout, we see taillights, one always broken, fading away across the field. We wait until we see the lights of his house go dark, as well. “The coast is clear.” I want to say it this time; you always get to signal that we’ve won. Then we make our way to the sleeping herd—squat, shaggy, overfed ponies. They allow us to lead them by their manes to the fence. We put a foot into the wire and throw ourselves onto their uncombed backs, so broad our legs will barely reach. But what would be the fun of that, when we can raid and run and reconnoiter? It remains our pattern throughout adolescence, rowdy siblings and yet innocents, wily partners in theft and laughter. 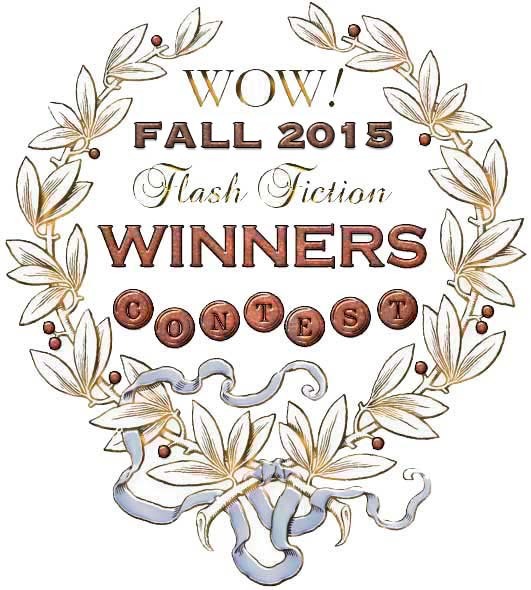 This brings our Fall 2015 Flash Fiction Contest officially to a close. Although we’re not able to send a special prize to every contestant, we will always give our heartfelt thanks for your participation and contribution, and for your part in making WOW! all that it can be. Each one of you has found the courage to enter, and that is a remarkable accomplishment in itself. We’re looking forward to receiving your entries for our next contest. Best of luck, and write on!